The Art of Dreams is our human potential that is often neglected as we age, and forget the magical realms of travel available to us to utilise as part of human evolution. For beings who intend to increase their awareness and understanding of dreaming, lucidity and navigating the dream realms (Second attention). Inspiration for writing in your journal. Booster for the 'dream traveler', and the aspiring warrior. Also helpful for the 'sleep resistant'. Sacred Geometry - inspiration from the devic realms. Flower essences: Combo Dreaming; Marjorma, Roas Centifolia Parvifloria, Scarlet Pimpernel, Passion Flower, Forget Me Not, Blackberry, Quartz, Dendritic, Manganese, Selenite, Helium, Luna, Spica. Zinnia, Wallflower Donkey Orchid, Inspiration Orchid, Fuschia, Rainbow Catcus. Essential Oils: Spruce, Cedarwood, Frankincense, Myrrh, Camphor, Labdunum, Lime. In a base of structured spring water, grapefruit seed extract and love! Spray your pillow, then your Aura around head (or vice versa). 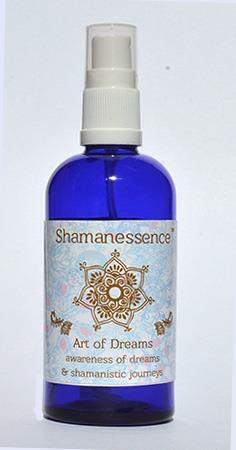 You may also spray around whole area before and during Sweat or Ayahuasca ceremonies.